Connacht defeated the Scarlets for the first time since 2011 thanks to an impressive second-half display in the Pro12 encounter at the Sportsground. Steve Shingler's penalty and an unconverted Harry Robinson try put the Scarlets 8-0 ahead after three minutes. A Jack Carty penalty left Connacht trailing 8-3 at the break and he added another penalty before Matt Healty's try edged the hosts in front. Carty's third penalty sealed a comeback victory for the Irish side. Connacht failed to gather the kick-off and the Scarlets quickly set up a lineout maul, with George Naoupu's infringement punished by Shingler's only three-pointer of the night. Worse followed for the westerners as Carty allowed a kick to bounce in front of him and his opposite number Shingler swooped on it to send winger Robinson over to the left of the posts. However, the fly-half missed the conversion and a subsequent penalty, while Carty slotted over a penalty before Shingler failed with a drop-goal attempt. A couple of noteworthy carries from Denis Buckley brought Connacht into scoring range early in the second period, and Carty clawed back another three points following a strong scrum. Connacht conjured up a smashing try just moments later. The Scarlets lost ruck possession over halfway, Michael Kearney fed Dave McSharry and his well-timed pass released Healy, who showed excellent pace to win the race to his own kick through. Carty was unable to convert from the left touchline but Connacht continued to earn penalties at scrum time and they gained 15 metres from a monster maul towards the right corner. As the rain came down Jacobie Adriaanse infringed a five-metre scrum, allowing Carty to make it 14-8 and man-of-the-match Aki hurtled into tackles to keep the Scarlets contained. Frustratingly for Wayne Pivac's charges, they lacked the possession and territory to respond. 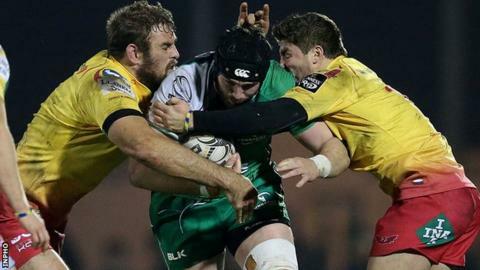 After Carty pushed a drop goal effort wide and missed a late long range penalty, Connacht's pick-and-drive efforts wound down the clock to copper-fasten their first win in six meetings against the Llanelli outfit. Connacht: Muliaina, Poolman, Aki, McSharry, Healy, Carty, Marmion, Buckley, McCartney, Ah You, Roux, Browne, Muldoon, E. McKeon, Naoupu. Replacements: J. Cooney for Marmion (75), Bealham for Ah You (45), Kearney for Browne (45), D. Leader for Muldoon (75), Faloon for Naoupu (71). Not Used: Heffernan, Loughney, Ronaldson. Scarlets: S. Evans, Robinson, Tagicakibau, King, K. Phillips, S. Shingler, A. Davies, John, Myhill, P. Edwards, Earle, Snyman, A. Shingler, J. Davies, Barclay. Replacements: Owen for King (48), W. Jones for John (78), Elias for Myhill (76), Adriaanse for P. Edwards (51), Rawlins for Earle (71), Pitman for A. Shingler (66). Not Used: Hardy, Lewis.